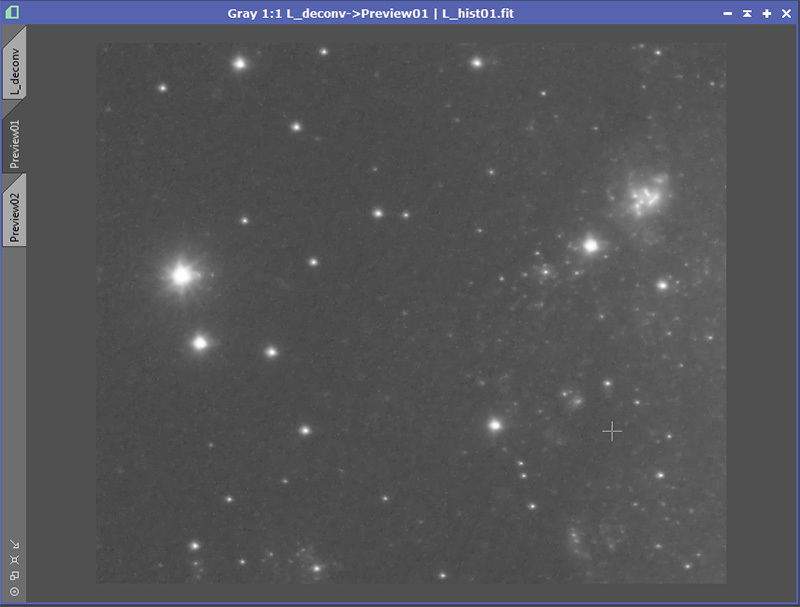 My favorite and a relatively recent addition to PixInsight is the TGVDenoise Process. 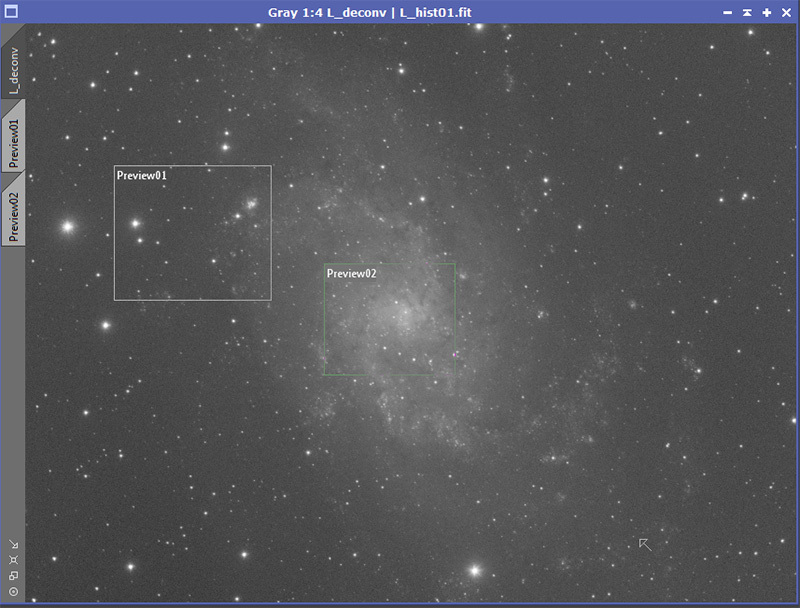 This process can take even longer than deconvolution so definitely define a preview using [alt]n. I'm going to define two of them: one where there is background as well as some interesting detail, and one over the center of the galaxy. 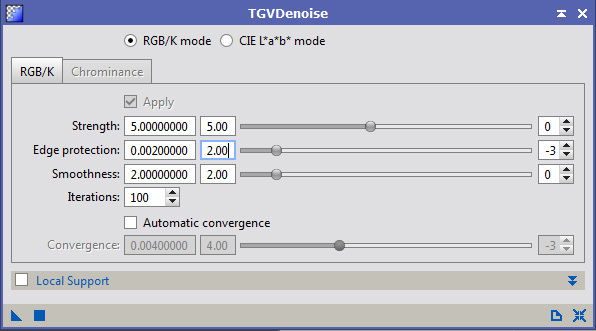 Now bring up the TGVDenoise process. I don't particularly like the defaults although they work at least acceptably well with this image. Here is the center preview with the defaults. 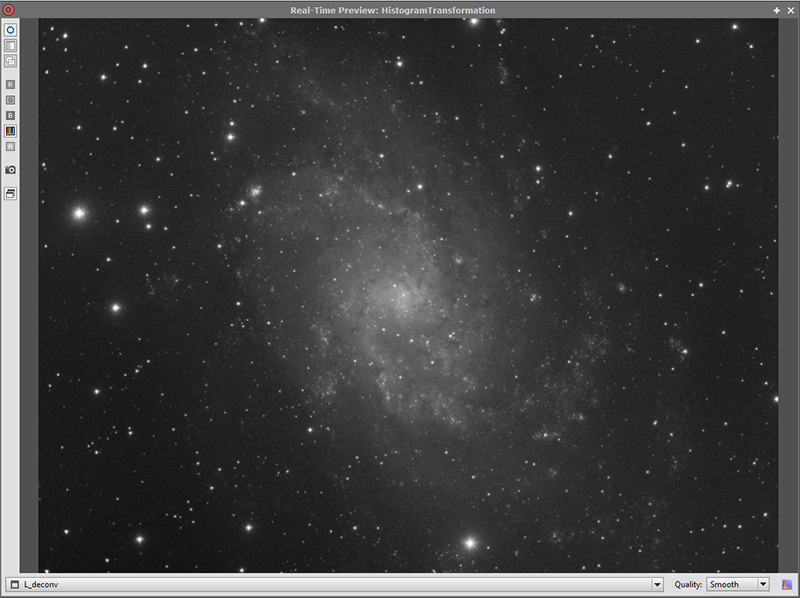 A good starting point for many images is to up the number of iterations considerably to 500. Then bring the strength way down to between 1.2 and 1.4. Fiddle around with the settings until you find something you like. The most important of the sliders is actually the middle one, edge protection. After trying a number of settings, I ended up with these. Here is the background preview after applying it. This was the preview before it was applied. Now apply the settings to the image as a whole. Go ahead and get rid of the previews. (Under the Preview Menu, there is an option for delete all.) 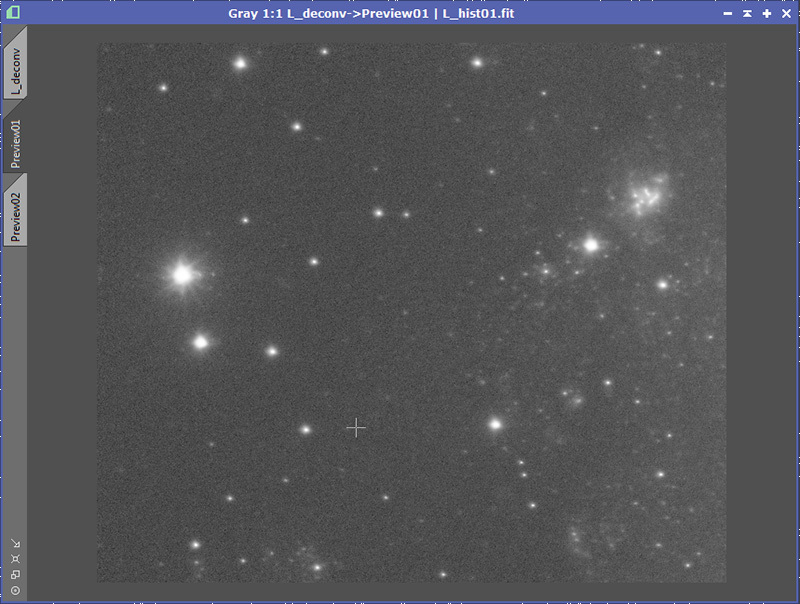 Once you do this, the histogram will look markedly different. Notice how flat things are to the left of the hump. In the HistogramTransformation window, there are a number of handy tools. 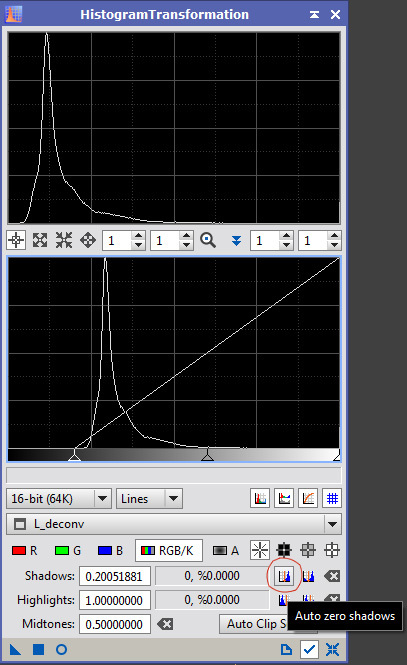 One of these is the "Auto zero shadows button". I have circled it in red to make it easy to find. Press it. 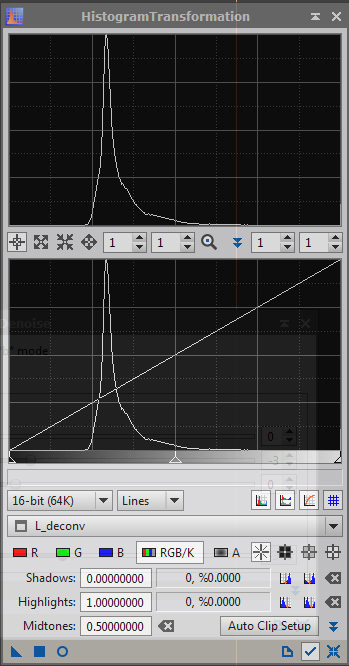 Your histogram will now look something like this. Now using the middle slider and the real-time preview, adjust the image to your taste. 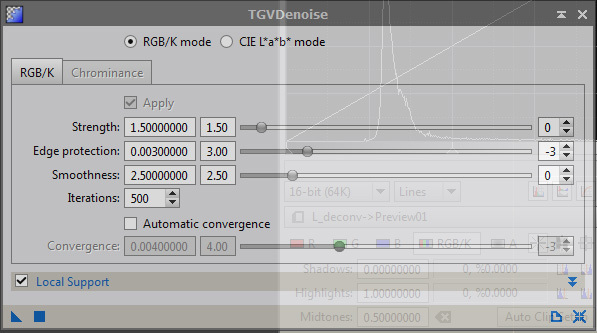 Again, delete the preview and apply the HistogramTransformation to the image. 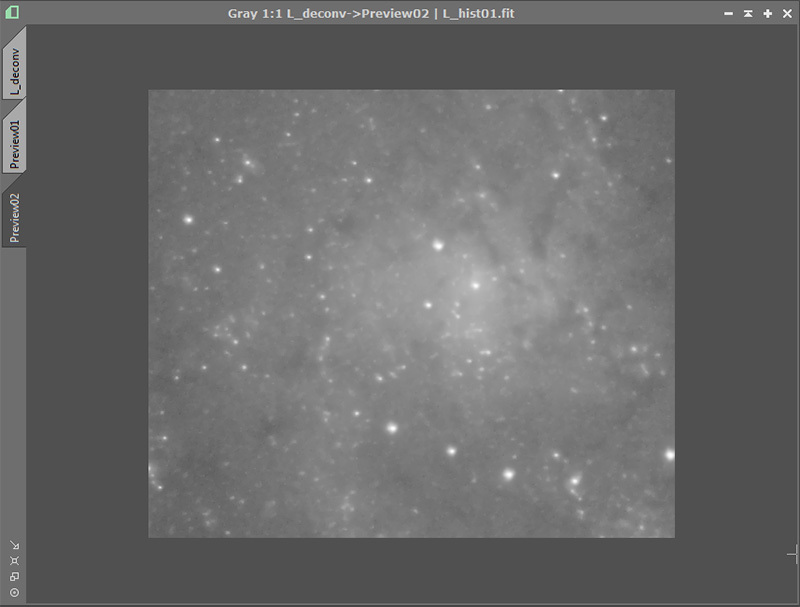 This concludes the processing on L portion of the image. Make sure you save this version of the image since you will need it as a file in a later step. I called mine L_final. Next up are the color channels.